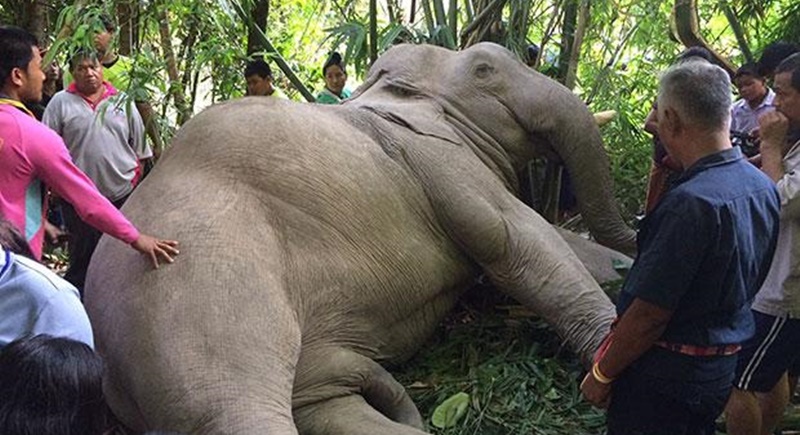 SURAT THANI: A male elephant was electrocuted when bamboo stems tangled high-voltage power transmission lines while he was browsing in Khian Sa district of Surat Thani yesterday (July 25). Thanongchai Churak, 37, the elephant’s owner, said he tethered 24-year-old Phlai Singthong in a grove of bamboo to allow him to eat. When the elephant grasped some of the bamboo stems with his trunk, they brushed against power transmission lines running overhead. He apparently received the full charge as the electricity grounded through the bamboo, and fell down dead. Mr Thanongchai said he would have to bury the unfortunate elephant.